At Play In The Wild Meadow by Joel Bruce Wallach - 7.250" x 10.000"
At Play In The Wild Meadow poster by Joel Bruce Wallach. Our posters are produced on acid-free papers using archival inks to guarantee that they last a lifetime without fading or loss of color. All posters include a 1" white border around the image to allow for future framing and matting, if desired. Thank you, Diane; an excellent question - what kind of creatures are we? Thank you for these great insights, Lois; goat cookies are the perfect solution. What a little cutie. Fabulous work of art. Glad you enjoy this one, Anthony! Thank you for exploring this universe, Catalina! Glad you enjoy this one, Melly! Thank you for experiencing the subtleties, Rosemary! Thank you, Beth; the goats do specialize in adorableness! 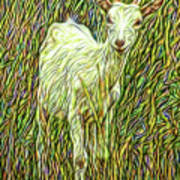 Thank you for experiencing the friendliness of this little goat, Sandra! I appreciate your insights, Carol! Love this happy goat. Awesome friend. Thank you for exploring the world of this happy goat, S-Ray! I do believe this little cutie is smiling back at you Joel. Great creation. Thank you, Bunny; goats seem to be smiling much of the time! 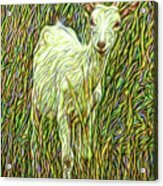 In Boulder County, a playful young goat stops for a moment to look our way, as if to share the feeling that everything is possible on a bright day in a beautiful wild meadow, here on a peaceful farm in Longmont, Colorado. 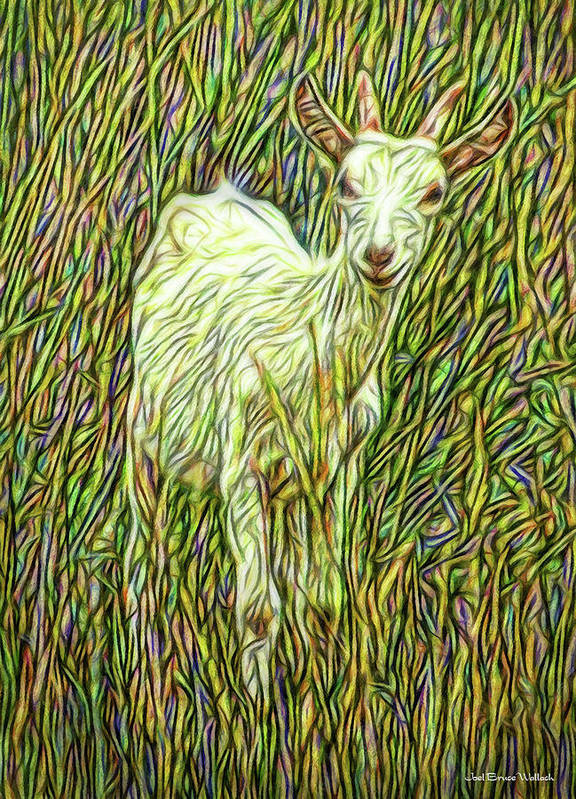 Joel created this vibrantly shimmering work in his signature neo-impressionist style, to express the joyous freedom of a goat playing in the fields, so that we might remember the spark of creative possibilities that lives within us. If you like this image, please use any of the buttons (i.e. FB, Twitter, and Google+) to share with your friends and family!